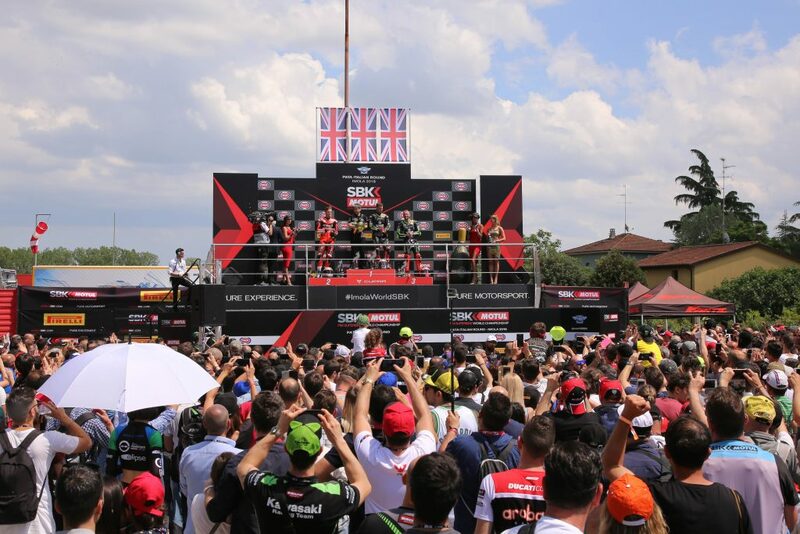 Imola, May 13, 2018 – The 16th edition of the Superbike World Championship in Imola will go down as another great success in terms of numbers. 76,317 fans and spectators attended over the three days packed with racing (1,202 more than 2017). Autodromo Internazionale Enzo e Dino Ferrari’s place in the series has once again been confirmed as a top event. Sunday was a fantastic day of motorsports, made even better by the presence Aida Yespica, sponsor of SBK 2018 and the continuation of the epic duel between Jonathan Rea (Kawasaki) and Chaz Davies (Ducati). Despite his courageous resistance, the Welshman from Ducati could do nothing against the three-time world champion, who seized his second victory, moving decisively ahead in the championship. Tom Sykes (Kawasaki) made it onto the third tier of the podium after managing to pass Xavi Fores (Ducati) in the last laps. A great 5th place for Jordi Torres (MV) who was able to leave Alex Lowes (Yamahama) and Michael Ruben Rinaldi (Ducati) who gradually lost ground after a decisive start, behind. Unfortunately for Marco Melandri (Ducati) he was knocked out by Michael van der Mark (Yamaha) while he was chasing third place. Lorenzo Savadori (Aprilia) also had to withdraw after falling in his fifth lap. In the Supersport World Championships, Jules Cluzel (Yamaha) was victorious in part due to an error by Lucas Mahias (Yamaha), who slid at Rivazza while in the lead, giving Cluzel the opportunity to bring home his second consecutive win. Mahias was able to recover from his fall, however his delay proved too great and left him in eighth place costing him his lead in the championship. His curse turned into a blessing for Randy Krummenacher (Yamaha) who finished fifth giving him the lead in the series. The rest of the podium was reserved for the great Italian riders: Federico Caricasulo (Yamaha) and Raffaele De Rosa (MV). Ana Carrasco dominated the World Supersport 300. The Spaniard immediately got into a rhythm that proved unattainable for her rivals and led to her winning by more than 13”. Second place was hard won by a fellow Spaniard, Sanchez, who went up against the Italian Sabatucci. Finally, in the European Superstock 1000 Mameli’s hymn resounded thanks to the success of Matteo Ferrari (Ducati) who in the final managed to block Roberto Tamburini’s (BMW) comeback. The Chilean Maximilian Scheib (Aprilia) also did well coming in third. Uberto Selvatico Estense (President of Formula Imola): “Once again the response from fans was extraordinary, more than 76,000 attendees in the three days is a reason for great pride. A success that is due to the collective effort from all the forces in the field who worked in full harmony for this great result. I would also add that the Imola circuit is considered by everyone to be one of the temples of the world of motorsport and the races that occur on this track are often challenges of proportions. Today we saw one, with two incredible champions, Jonathan Rea and Chaz Davies who delighted the audience with a thrilling duel. We are one of the top events in the championship and over the next two years want to continue to be one.